"Opera just grabbed me, it almost stole me away from reality, and I just had to be part of it!" Nadine Sierra was just 10 years old when her mother, who's from Portugal, brought home a video tape of Puccini's La Boheme. "And she brought it to me from our public library in Fort Lauderdale, Florida  which we never returned because I was obsessed. I watched it all the time and just knew I had to become an opera singer!" 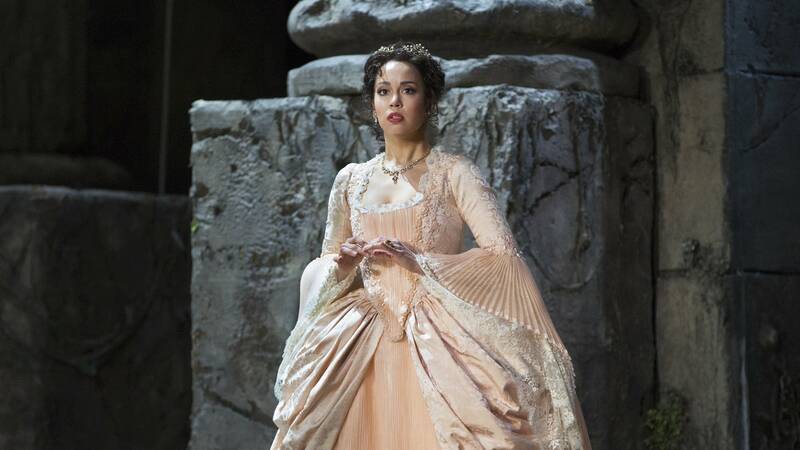 At age 21, soprano Nadine Sierra became the youngest winner of the Metropolitan Opera Council Auditions. Now, at age 30, she's just released her first recording. Your debut recording one might expect would be filled with familiar opera arias. But it's not. It's a reflection of you and your family and perhaps what they've gone through to establish a life in this new country. Can you talk about the theme behind There's a Place for Us? "I do come from this family of people who immigrated to the United States  not just my mother, who immigrated when she was 18 years old from Lisbon, Portugal  but my grandfather and my grandmother on my father's side immigrated from Puerto Rico and Italy. This story is not just one that belongs to me. It's also a story that belongs to millions of people who have had to immigrate to certain countries in order to seek a life with promise and opportunities." The title of the recording comes from the lyrics from the first song, that opens the release, which happens to be from Leonard Bernstein, and we've been enjoying celebrating his centennial this year. Why was this the right piece of music to lead off your new recording? "He wasn't just a genius composer, conductor, pianist. He was also a social and humanitarian activist and he used a lot of his compositions to showcase his personal views on those social issues, especially in the 1950s. He risked his career for his humanitarian views and that's kind of what I want to do as an artist." There are several songs on the recording that blur the lines between opera, musical theater, art song, popular songs. One that you sing so beautifully is by Ricky Gordon and it's called Stars. What about this beautiful lullaby resonates with you? "Stars is a song kind of highlighting this idea of people of color, minorities, feeling a certain way especially in this country. And that's what this album is about. It's about breaking down those barriers and breaking down those prejudiced views for the better of all people." We don't have time to talk about every single piece. I do want to ask you though, is there one or two that you want to be sure we talk about that we haven't touched on yet? "The Melodia Sentimental by Villa-Lobos is one of the biggest songs for me because it was a song that was introduced to me when I was very young  I was 13 years old. My vocal coach, Kamal Khan, introduced it to me because of my mother. My mother is Portuguese. Villa-Lobos was Brazilian, but of course the language is Portuguese. And, of course, the music is so beautiful and also kind of lost in the classical vocal repertoire. You don't really hear very many singers performing Latin music." As you were putting this recording together, was there anything that you learned about yourself? "I was going through a very interesting time, actually, when I was recording this album. Not only career wise but also personally. So, for me, recording the album was also very therapeutic, because I was also coming from the States, where we've been having certain issues and negative messages  I find them to be very negative  and I wanted to release all of that into something good, into something peaceful. "When I was in the room recording it in London, I was looking out at all of the people in the orchestra, as well as Maestro Robert Spano and the people in the engineer room, you know, listening, and I thought, 'Look at all of these people from all around the globe, in one room all together, performing all kinds of music from these different composers.' This is the kind of world I want to live in, where, no matter where you come from, if we join together as a unity, we can create something very powerful and very beautiful. I think human beings are very capable of doing that, if they set their minds to it."